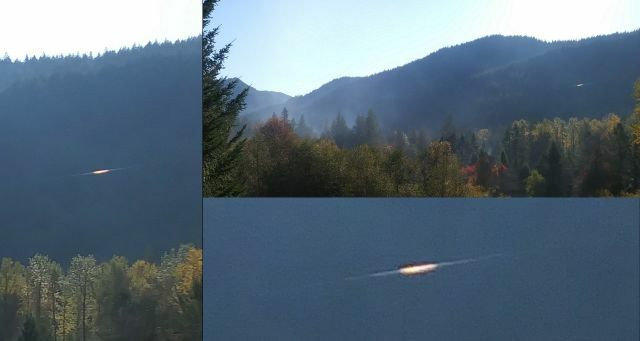 On November 11, 2018 a bright anomaly has been photographed in the sky of Welches, Oregon. The photographer was on vacation taking photos of the scenery with his cell phone. When he reviewed the photos, he found an anomalous light that looks like a glowing golden disc seen from its side. He did not see the anomaly while taking the photos. At first he thought that it may be some sort of camera glitch, but he took a couple of photos of the same spot from the same vantage point all at the same time and the golden disc appears only in one photo. The photographer has submitted the images to Mufon for further investigation of the unknown object.